After renting a car at the Brussels airport and spending the night in Bologne-sur-Mer, I set out very early to drive to my first destination of the day, Le Moulin de Verval, the highest point in the Pas de Calais department. I arrived in the small hamlet of Le Verval at about 5:15 and quickly found the point marked in the peakbagger.com map a few minutes later about 1 km outside of town. 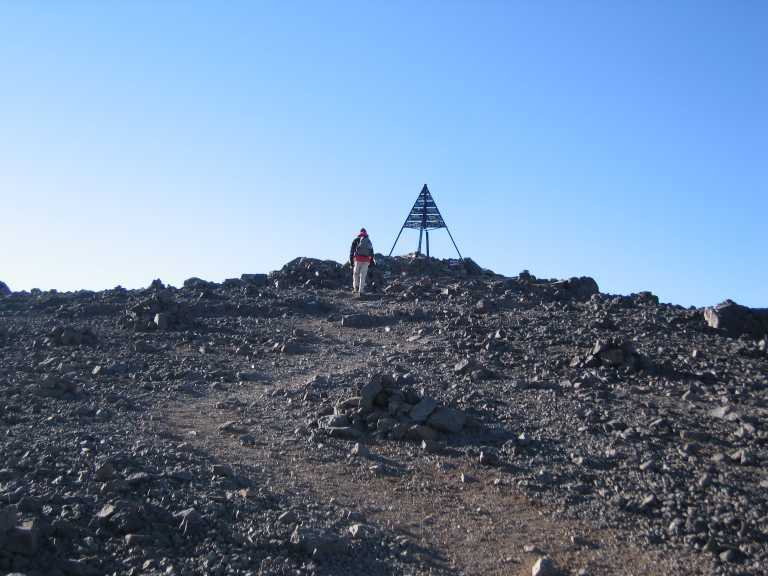 At 211m it is not really a peak or other notable summit, no, actually there is not even a bump of anything indicating the highpoint. The departments highest elevation is simply the highest point on a plateau, along a dirt road. None of the points in the nearby fields or pastures looked higher, and after walking back and forth a few times to make sure that I had really "been there", I was satisfied and got back in the car to continue on to my second peak of the day, after taking a picture of the village church and the village sign as additional proof. It says on peakbagger.com that this is probably the highpoint of the French department of Pas-de-Calais but that there several other 211m spot heights in the area. The high point is certainly not Mont Hulin. Well, this was the second stop of the day (many more to come). It took me about 2hours of driving (much more to come as well) along small departmental roads to arrive at this roundabout at 7.30am. I parked off to the side and due to regular traffic could not cross over the artificial high point in the center of the roundabout right away. I must say that I was also slightly embarrased: Why would anyone go to the center of a roundabout on a fairly busy street, camera in hand and take a bunch of pictures in all directions? A real estate developer, a prospector? Well, I knew the truth and did take a bunch of pictures, but it occurred to me that none of the passing motorists was aware of the significance of the spot where I was standing. No one in the department was "higher" than me (at my 215m), except those in multi-story houses and in airplanes, and maybe someone climbing up a ladder, but no one else. This though really left me sort of 'high" when I walked back to my car in order to continue on to my next high point. I found out later (again from Peakbagger.com) that this is the true HP of the French department of Somme. It lies 9km S of the previously nominated HP Arguel et Gauville. The spot height is on a roundabout called Carrefour les Quatre Arbres, on the D1015 S of Le Coq Gaulois. This time it took me only 50 minutes to drive into the next department (Oise) and find its highest peak, which is also known as Mont Pognotte. Near the town of Lalandelle, the departemental road I was driving on (D22) led in a switchbacky fashion up to a pleateau (where the town itself is located) and about 1km before the town I found a parking area on the right hand side with an orientation table. I stopped to check it out and found in the orientation table to be at an elevation of 240m, already 4 meters higher than the supposed highpoint of this county, located another 2 km further east. Hmm, I wondered, why put up an orientation table here? But I the reason must have been the nice vantage point, which was impressive in that it was just on the edge of the plateau and the views were quite nice. I took a few pictures before continuing on the the actual summit (one again trusting peakbagger.com and the information they give). Well, the map I had printed from the website led me onto a smaller road, passed a farm and another 200m beyond the farm to the supposed highpoint. I stopped and found it right next to a steaming pile of manure, which a local farmer was storing in that location to distribute it on a nearby farm as soon as the weather permitted it. Luckily I did not have to climb the manure pile to get to the actual highpoint because there was a little mount of dirt/construction debris grown over by grass that was just a few feet higher than the less inviting choice that I climbed instead (but even this was not very pleasant, because for all the grass I could not see the surface I was climbing on and thus not easily avoid uneven bits of concrete or even the metal spikes sticking out. I should have climbed the nearby telecommunications tower instead, but that one was off limits and I contented myself with the debris pile taking a couple of pictures of my surroundings and hoping that the next peak would be a little bit more interesting, because the first three sure were not. (an internet search after my return did not tell me whether I had really reached the department's highpoint or not, nor did I figure out anything about the height discrepancy of the orientation table (240m) and the supposed highpoint (236m). To be continued). Ok, no we are getting there. Here I actually had to walk a bit (well, maybe 100m, but more than before). It took me about 4 hours of driving (also including my power naps, as I was getting tired, a lunch break at McDonalds (mostly for the internet connection) and dismal wheather (I never switched of the windshield wipers) to get to my next destination after passing the cities or Rouen and Caen. Luckily by now the rain was behind me and it was dry (if not nice). Access to Mont Pinçon was pretty easy. I drove to the highest point of the departmental road D54 south of Aunay-sur-Odon and then turned right onto the dirt road. I had read about a waymarked trail with numbered signboards that I did not see right away. However, close to the first signboard, where I parked my car because I saw that the open forest to the left was still leading uphill I found the summit was a nice round orientation table not 100m from the dirt road. On my way there I had to pay attention not to get my feet wet as there was still puddles everywhere and not always immediately visible due to the high grass. It was clear that there had been quite some rain not too long ago and I was glad to have spent that time driving. I arrived at the orientation table with dry feet and immediately starting taking pictures. The forest opened up a the south and I managed some nice, almost scenic shots. The orientation map included Mont St-Michel and I was reminded that I was fairly close to the ocean. I was tempted for about 10 seconds to visit France's third (I believe) popular tourist attraction after the Eiffeltower and Versailles or Notre-Dame (or something like that), but the hoards of tourists that I would undoubtedly encounter turned me of. Also, I had different (more important) objectives today, and that thought got me moving again and I quickly returned to the car. I then followed the dirt road a bit further and found more signboards, even though it was not always clear what they were pointing out (there is probably a paper guide available somewhere that explains it all in detail). I saw yet another telecommunication's antenna before coming to a bit opening already on the downhill part of the mountain with a parking area and a fairly large war memorial about 50 meters along the downhill part. The memorial had been placed their by the British and commemorated the 13/18th Royal Hussards (Queen Mary's Own). Apparently it was not some specific battle the memorial was for, but rather the sacrifice made by all Royal Hussards from 1922 and 1992 (when the memorial was put up), but the location must have been significant and sure enough a nearby sign explained that the Battle of Mont Pinçon had taken place here in 1944 (August 5-7) during the battle of Normandy. The sign also explained the exact details of the battle, which made sense at the time, but which I have forgotten now. All in all this was an interesting visit, so far my longest stop (40min) and it got me in the mood for things to come. Luckily it only too me 25 minutes to drive to the highpoint of the Manche department, called St-Martin-de-Chaulieu and located in the town of (surprise!) St-Martin-de-Chaulieu. So, this one turned out to be the nicest high point so far today, probably also because the sun had finally come out. It is actually located almost in the center of the village of the same name and marked by a very nice tower. The summit is marked by a signboard proclaiming it's highpoint status, but the actual highpoint (marked by a "borne") is over a gate in the field next to the tower, maybe 20m away and 1m higher. I just hopped the gate and walked to it. The church of St Martin de Chaulieu lies just below the summit, and the rest of the village consists of about 6 houses and the views in all directions were quite nice as this was obviously the real highpoint of the area and all the rich farmland in the surroundings was clearly lower than the tower. At 365 meters this was also the highest point I had been to today. After visiting the highest point of the Manche department I debated whether to continue west into Brittany, but the hour of the day and the limited time alloted to this adventure made me head east into the "Orne" department, whose border I crossed one hour after leaving St-Martin-de-Chaulieu. But it was actually the Mayenne department's highest point I would be visiting next and I crossed the border to the Manche about 2 minutes after entering the "Orne" department (whose high point I would also eventually get to, hours later). About 10 minutes as I was approaching the town of Pré-en-Pail I could already make out the view tower a the highest point of the "Massif armoricain", which clearly stretched out in in north-southernly direction along the horizon. Still another 20 minutes later I parked next to and climbed up to the impressive summit tower. The views were quite nice in all directions, even though there were still quite some dark clouds on the sky. With the help of numerous orientation maps on the top of the tower I learned that I was 420 kms from Brussels and about 1070 from Berlin. At 417m I was not only at the highest point of the Mayenne department but also at the highest point of the French region "Pays de la Loire". There are only 22 such regional highpoints and naturally that is another one of my lists to slowly "get done". After having had the top of the tower to myself for 10 minutes a couple of cards pulled in to the parking lot and a couple was the first to join me at the top. I quickly asked them for a picture (they took quite a few) with my camera before the summit would crowd up and I soon went down to my car in order to continue on my own private Tour de France. I drove passed the town of Alençon in an eastern direction to to the Forêt de Perseigne. This high point of the Sarthe department cannot be missed as similarly to the Mont des Avaloirs there were plenty of signs pointing the way. And thus 40 minutes after leaving the Belvédère des Avaloirs I reached the Belvédère de Perseigne, at 340m substantially lower than its predecessor. I could drive up to within 50m through the forest on the D234. A skinny 30m tower marked the highpoint, but there is actually higher ground just E of the Belvedere (tower) itself, just into the forest. On the latest mapping there is a 340m ring contour. The tower was locked at the time of my visit but it state on a notice that it would be open on weekends and holidays during the summer season. With nothing else to do I thus venture into the area east of the tower, through high ferns in order to find or at least have been to the actual highest spot. But it all looked the same, i.e. a fern cover and I am not sure my foot actually touched that special spot. However, even in the winter with less vegetation I am not sure the actually high point could easily be discerned, as it is just a flat plateau. Anyway, no worries, No 7 in the bag, of to No 8. Yes, but No 8 turned out to be a bit trickier. I found the roundabout crossing of D26 and D226, about 40 minutes north of Alençon (which I had visited for about half an hour before because it is the partner city of Quakenbrueck, my birthtown in Germany) without much difficulty (there is a memorial there with a tank, which is hard to miss. Apparently the battle of Alençon had taken place somewhere in this area. The roundabout is also called Carrefour de la Croix. Then you turn on a small paved road straight west. There are about 7 roads arriving at the roundabout, but the one you are supposed to take goes straight west and is straight itself for a few kilometers. After about 1km there is an opening in the forst with a little gravely/dirty parking area on the right hand side and a a sign at about "5 o'clock". I knew from Lee Newton's trip report to look for that sign, but because it was sort of in my dead angle, I missed it on my first drive through and went too far. Eventually I drove back and then saw the sign right away. I parked the car and stupidly walked in a northernly direction following the topo map from peakbagger.com. I say stupidly, because if I had paid better attention to the map, I would have seen that I should go south and not north, but the driving and turning around and roundabouts had gotten me confused. Luckily, I realized that I was on the wrong track, as the forest road I was on, went downhill and it seemed impossible to find a high point lower than where I had parked my car. So, I consulted the map again and found the right forest road (a small path really),just opposite the paved road, almost a mirror image of the road I had taken. And sure enough this new path still led uphill very gradually for about 150 meters before I saw the trig, just a few meters on the right hand side in the forest. It could not be missed because a use trail was leading to it and it was clear that quite a few people had visited this place before me. Yippie, I felt elated, took a few pictures, walked around the trig to make sure that I really had really walked on the actual high point and went back to my car. Well, the rest of the day consisted mainly of a bunch of driving. I stopped for a quick visit to the high point of the "Eure" department. For that I had to drive north from the town of L'Aigle on the D919. About 4km before getting to Glos la Ferrière there is a farm on the right-hand side of the road called (and signposted) Les Bruyerès. Unforunately, the actual high point was located in a wheat field near the farm and I did not want to walk through the wheat. I crossed a ditch, a fence and some thorny brush to stand on the edge of the field, but decided that was far enough. For once, it was not clear if there was a higher point, as the vegetation made it impossible to see such a point. Furthermore, the field was fairly flat and if the actual high point is really 250m then I was at least 249.5m where I stood, if not 250m. The border with the Orne department was very near (and half of the field may have been in it already, and the fact that it was not a summit at all but a slope point since the ground continues to rise over the departmental boundary into Orne made it tricky. So it would be impossible to tell (except with the use of some technical measuring equipment) the exact high point. It should be somewhere about 100m east of the farm, that is behind and slightly left as you look from the road. I thought that where that was good enough and I officially declared myself to be on the high point of the Eure department. It was also already past 8 pm and I had yet to find a place to sleep. I continued driving north towards Rouen, and while driving made a reservation at a hotel. I told them I would be late, but they promised to keep someone at the desk until about 23h and I was optimistic that I would arrive in time (I eventually got there with only 10 minutes to spare). During my drive north, when it was getting dark, I drove through the town of Bernay, which turned out to be the partner city of Cloppenburg, another city near my hometown in Germany. After waking up in my hotel in Rouen, from where I had a fine view of the Cathedral, I walked around the city for a while looking for breakfast. I bought some juice and a few pastries that I then consumed in the car on my way out of town to my only high point of the day, at the 247m in the village of Conteville, the highest point in the Seine-Maritime. As is often the case with these "flat" high points (and quite frustratingly so), it was hard to discern the actual highest point. I drove the city streets until what I thought was the highest point and then got out of the car to take a few pictures. Not even a GPS would have helped much, because their margin or error is often higher than the difference from one street to the next in Conteville. I counted it though and added it to my list of "done" high points. 10 in 1.1 days, not bad. On last count I am now done with more than half of the 96 French highpoints, that is 53 to be exact. My next trip should be two the Pyrenees mountain range, because while I have more than 50 percent of the French highpoints in nominal terms, so to speak, I am probably not even at 1/3 yet in terms of elevation.